On paper, Firewatch doesn’t sound like it’s going to be a particularly exciting experience, sitting in a remote lookout tower waiting for fires to start. We’ve perhaps all thought about doing something similar at one point in our lives, disappearing off to the wilderness to escape the troubles of life and eking out simpler existence sounds gloriously tempting – for a short time, at least – but Henry, the game’s protagonist, has taken the leap and actually done it. This is the basic premise of Firewatch, but to put it in such simplistic terms isn’t doing it justice; there’s significantly more to it than that. You don’t simply sit in a tower watching for forest fires, although there is some of that – it would be a little far-fetched as a premise if there wasn’t to be any watching of fires in a game called Firewatch – but what starts as an innocent summer spent saving the Wyoming wilderness escalates into a tale of mystery and intrigue, that has ambitions of mixing it up with the very best adventure games, past and present. The crew at Campo Santo certainly have pedigree in this regard: a number of the team have worked on Telltale Games’ The Walking Dead and Tales of Monkey Island, among others. Traditional graphical adventure games, often known as point-and-click adventures – though very little pointing and clicking remains in the glossy, modern implementations – have grown up and out from their two-dimensional, fixed-scene beginnings into dynamic, cinematic affairs. For all the pains Telltale Games have done to remain faithful to the genre and the visual style of their various franchises, the likes of Until Dawn and Life is Strange have gone a step further, bringing a touch of Hollywood gloss to the genre. One thing that remains, however, is the notion of choice, that the actions the player takes and the way they handle certain situations within the game – especially when conducting conversations – has an impact on the way the story pans out. The other road down which graphical adventure games have diverged is into the first-person perspective – often pejoratively known as ‘walking simulators’ for their slow pace and reduced interactivity – with Gone Home and Everybody’s Gone to the Rapture as the biggest and best-known successes from this sub-genre. It’s fair to say these games aren’t for everyone, and the common criticism is that the player is passing through someone else’s story like a non-corporeal ghost, gleaning second-hand information about events that have gone before with no capacity to experience or influence the story. Firewatch sits somewhere in between these two established paradigms of adventure. 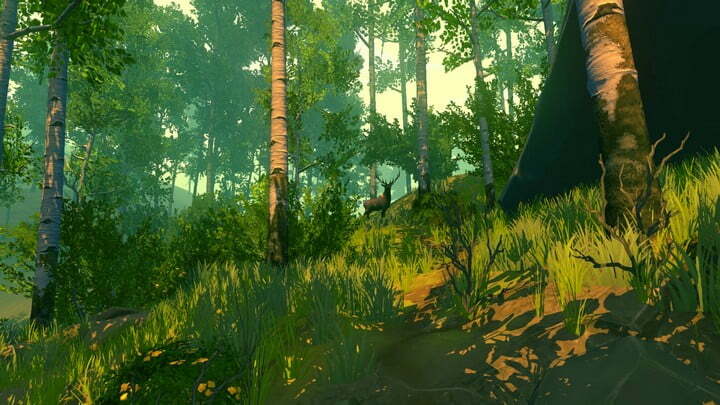 The perspective is first-person and the environment is experienced through the eyes of the protagonist, but all the key elements of the traditional point-and-click adventure – the exploration, the fetch-quests, the progressive dialogue and most importantly, the choice – have come along with Firewatch into this new perspective. There is of course the danger that fashioning two styles together could turn out as a distinctly Heath Robinson join, and Firewatch could easily have been a jack of all trades, master of none. Thankfully Campo Santo have got the hybridisation just right, and the end result? It’s the best of both worlds, plus a little something extra for their trouble. I must confess, I’m not a massive fan of the recent trend for interactive controls when manipulating objects, which is especially prevalent in the adventure genre. What is supposed to be an instinctive way of examining something you’ve found – with the character able to waggle it around freely to view it from all angles – often descends into frustration, and having to make frequent glances at the on screen prompts quickly shatters any implied feeling of realism foisted on the player by this mechanic. What is supposed to come across as a connected and intuitive extension of your body can instead appear unnatural, disjointed, and at times just plain weird. I’m usually the guy walking around frantically flapping his virtual arm, trying to put down an object that feels like it’s stuck to his disembodied meat hook by some sort of adhesive. That being said, Firewatch is probably the nicest implementation of this control scheme that I’ve come across to date. Interactions with objects within the game feels smooth and natural, with simple and reassuringly mechanical-feeling button presses to perform interactions – none of the bloody awful hammering of buttons to open a door, or timed press-and-holds to pick things up, or swirling the analogue stick round in circles to operate a control mechanism – followed by a fluid and dynamic object manipulation system that really does feel like the arm on screen is yours. When walking down from your lookout tower there’s a section with low headroom – you’ll place your hand on the structure to project your head as you stoop under it. When opening the padlock on a supply cache, your animated fingers will be working on the corresponding tumbler – you’ll also fidget and drum your fingers on the box lid. When climbing – either scrambling over or down rocks, or when using ropes – the animations will vary depending on the terrain you’re traversing, and if you fall it’s realistic. And hilarious. And realistically hilarious. This is the work of animator James Benson, who the Campo Santo team found when he was putting together a series of YouTube videos as a sort-of portfolio of his animation chops, where he re-imagined what Half-Life would look like if Gordon Freeman was more than just a gun pointing at the centre of the screen. It’s simple things, from Freeman’s hand being in view pressing buttons on the way into Black Mesa, through to him attempting to pry open the doors before resorting to crowbar for the first time or losing his glasses after taking a big hit, that make a real difference to the immersion. Where most games are happy to use embodiment animations for simple things like pressing buttons or reloading weapons – or even for Sonic the Hedgehog-style bored character animations, like Artyom trapping his finger while tinkering with his gun in Metro: 2033 – you can see every one of those tricks realised in Firewatch and then some, and with an animation for every single thing that happens in the game it never gets boring or repetitive. It really doesn’t get much better than this. 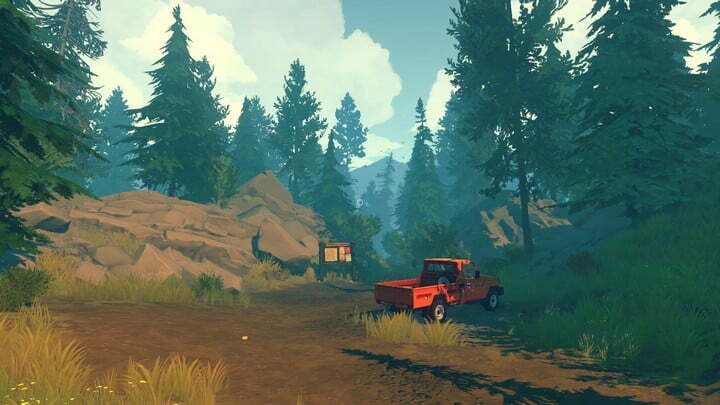 What Firewatch also does incredibly well is to feel accurate and of its time period – being set in the summer of 1989 – while still making allowances for the fact it is a video game. We’re all so used to mini maps and on-screen directional guides towards our next quest games often feel unnecessarily cruel without them, but without the cover of a generic sci-fi head’s up display to hide behind, making them feel in-keeping with the retro setting is a challenge. 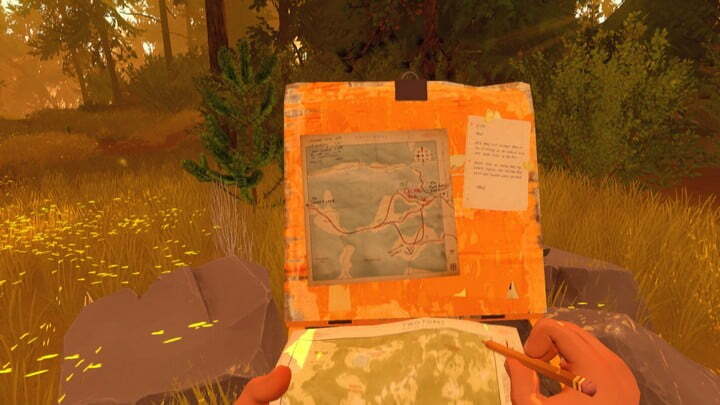 Campo Santo have achieved this beautifully by simply giving us a paper map, a pencil and a compass. As you progress through the game and find additional annotated sections of the map, you’ll copy the information down to your own map with your pencil, and will circle objectives and key areas on the map as you go. Being armed with a compass you can of course hold this up to orient yourself, but you can also walk around with it held out in front of you – a gift to those of us who rely on quest markers – and can even walk around with the map held in front of your face, but if you do you’ll miss out on so much of a beautifully crafted world. The challenge for Jane Ng and the team at Campo Santo was to translate this unique painted style into a first-person experience that still felt immersive and grounded around the player. 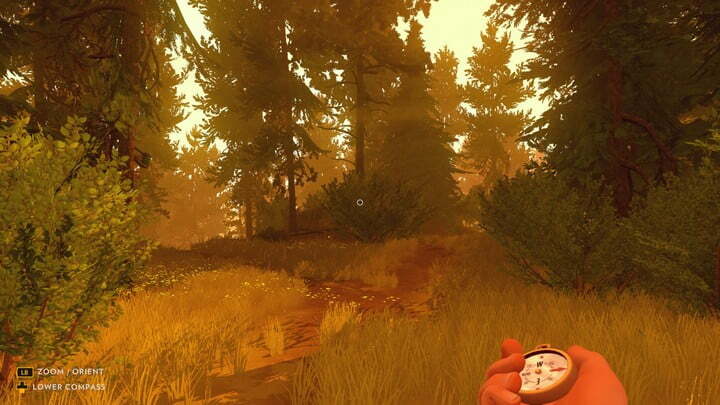 It would be relatively straightforward to render this stylised, block-printed world into being and is something that the Unity engine – upon which Firewatch is built – seems to excel at delivering, but when your ambition is deliver a complex and emotional narrative with the player in the shoes of the protagonist, the danger is that a world which looked cartoon-like might shatter the immersion at any time. There’s a plethora of really clever and interesting things they did to achieve this, from simple tricks like fog and lighting manipulation through to more complex solutions, including the increased flatness and stylisation of trees and foliage the further they are from the player’s view, or making interactive items – those that can be picked up and examined in more detail – appropriately more detailed than their surroundings, but we could talk about that for hours and we’d never really be any further forward. The net result is that Firewatch is both beautiful and unique, but if you do want to know more then check out our report on a talk Jane Ng gave about creating the art of Firewatch. 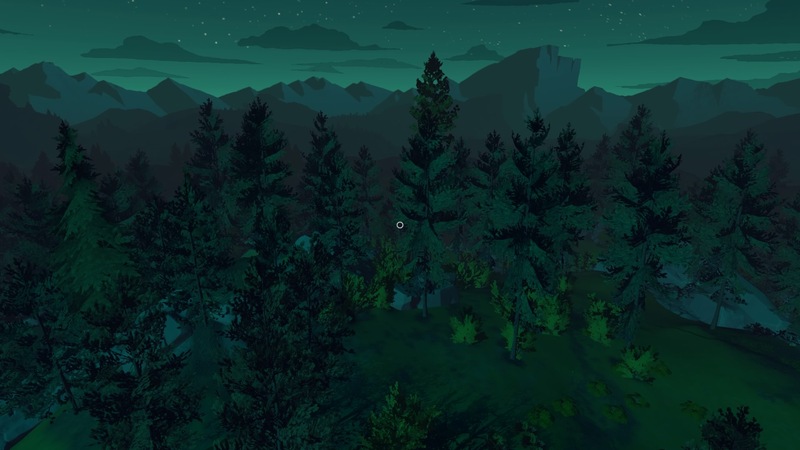 A colleague of mine felt that Firewatch wasn’t actually as pretty as he was expecting it to be, which surprised me because everything I was seeing was simply stunning. It’s worth pointing out at this stage he was playing on PS4 and I was using a mid-range gaming PC; he told me he did notice some stuttering and asset degradation during play, whereas my experience was glossy and flawless. It’s also worth mentioning that we’d recently been discussing Everybody’s Gone to the Rapture, the hyper-realistic Unreal Engine powered vision of rural England that looks as though it’s been ripped from our collective childhood memories, so I felt that perhaps the impressionist approach of Firewatch was being unfairly looked upon. PC source image, captured at 1080p with ultra settings on my PC. PS4 source image, captured at native resolution on his PS4. Overlay the PS4 image on top of the PC one in a graphics editing program. Cut off roughly the left half of the PS4 layer, so the PC image was visible underneath. Move the PS4 image about so that the tree in the middle lined up. Cropped the border of the image, so that no PC layer could be seen around the PS4 layer (where it had been moved to line up the tree). Added a dotted white line down the middle to signify the join (ignore the little white targeting reticule). Added the labels to show which part of the comparison was from which source. While things in the long distance look nearly identical, from the middle-distance into the foreground we see a reduction in the quality of the trees, foliage and shadows, past the levels of intentional stylisation of the game. He would also find that the frame rate would stutter periodically. This isn’t therefore an isolated incident of reduced graphical fidelity in the example above, but I don’t want to get bogged down into comparing frame rates and draw distances for the purposes of this review; I’m sure the Digital Foundry folks over at Eurogamer will produce a video pitting the PC and PS4 versions against one another to compare the running frame rates before too long, but that’s not why we’re here. For now, we’ll simply say that – as is expected with pretty much every video game release going these days – the graphical fidelity and performance of the PC version is superior to that of its PS4 counterpart, but hopefully there’s some optimisation or adjustments the team at Campo Santo can make to get the PS4 version running closer to the PC equivalent. 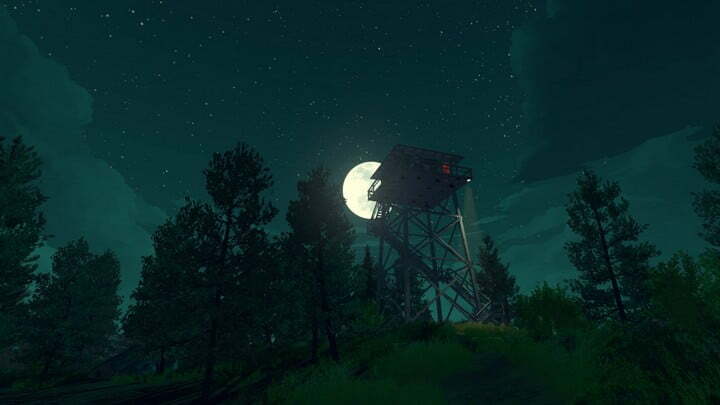 What’s more important than the raw graphical performance of Firewatch is the stylistic setting and the feelings it evokes through its tone. 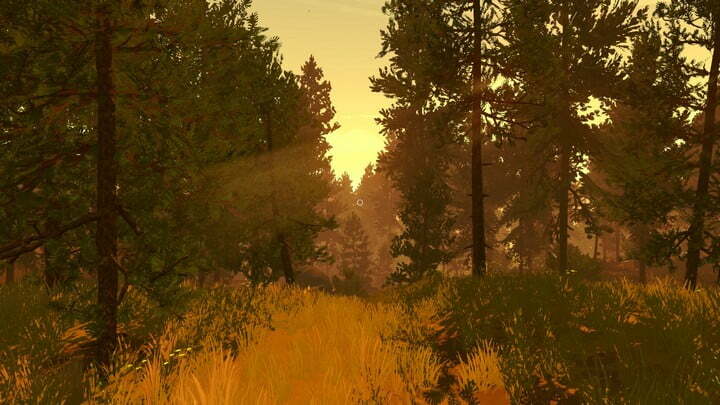 If most first-person games are considered the gaming equivalents of the ambitious, budget-busting works, shot using specialist equipment so they look great in an IMAX theatre, Firewatch is very much the art-house indie picture of the video game world, shot on a vintage Super 8 camera to help it feel authentic to the time, making it – and us, the players – far better for the experience. We’re going to talk about about the story of Firewatch for a moment now, and I’m going to do my best to avoid any spoilers. 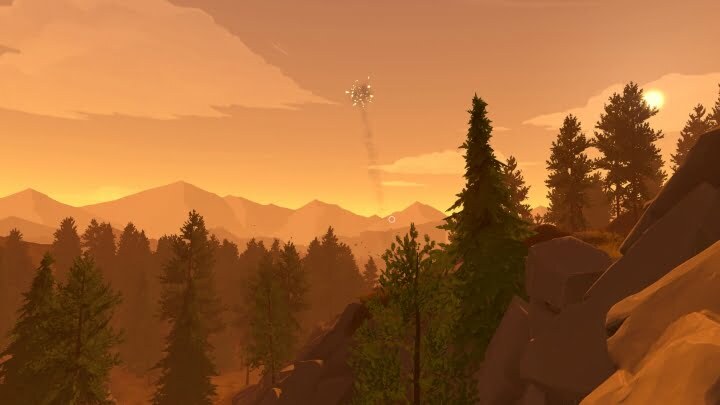 You may come away from this section of the review feeling that you haven’t learned a great deal and that’s fine: Firewatch is one of those games you should go into blind to get the best from the experience and I’d rather err on the side of caution. There will be some plot details here, but nothing you couldn’t already glean from trailers or videos produced by Campo Santo. The game opens with the story of how Henry – our protagonist – came to be a firewatch lookout in the Wyoming wilderness. It’s told in part through branching choices, selectable from the on-screen text as you read through the prologue, and through Henry’s actions in the first-person, as he packs up his life and heads off to take up his post. It only lasts for a couple of minutes, and while some of the choices (although significant for Henry’s character) seem insignificant to your progress – and you are ultimately funnelled to the same result of him experiencing an emotional trauma and wanting to get away from it all – the choices link through into what dialogue choices you’ll be presented with and how Henry behaves throughout in the game. These choices are similar in impact to the psychiatrist sections in Until Dawn, where selecting a fear of clowns over a fear of spiders will impact how the game tries to scare you for example, but they’re far more sensitively woven into the experience; they’re also charming, funny and sad in equal measures, and are above all very real and believable. When Henry has arrived in the Shoshone National Park in Wyoming, and made the two day trek from his truck to his new home in the Two Forks lookout tower, he’s greeted on the radio by Delilah. Delilah is his supervisor and for the next six hours or so of gameplay – or the whole summer, in their terms – is basically the only major relationship in Henry’s life. In another nod to the game’s fantastic use of technology – or lack thereof – their entire communication takes place over shortwave radios, the method Delilah uses to keep in contact with Henry and the other lookout towers under her supervision, although you get the distinct impression she talks to Henry a lot more than she does the others. 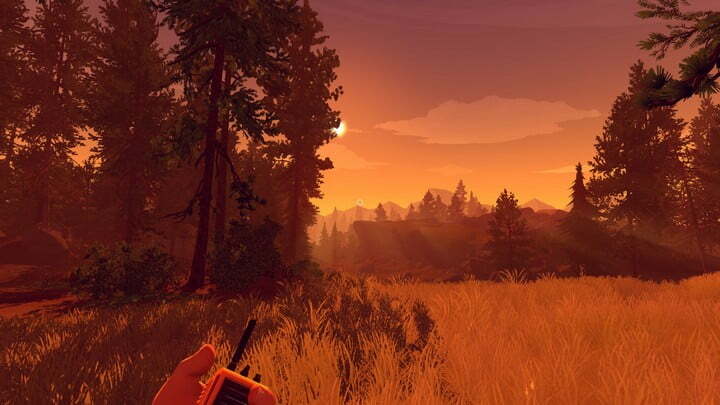 The use of radio contact for these interactions is the foundation upon which Firewatch is built, and it’s absolutely inspired for one key reason: you are contactable from virtually anywhere on the map. This means there’s no need to trudge back and forth from nominal quest-giver to destination, then back again to collect your reward and be given a new quest, and saves what could have been an interminable string of fetch quests into a delightful jaunt through the countryside. There is a downside to the radio formula from a design perspective, though: radio contact is a two-way medium. This is fine for an asked-and-answered interaction where Delilah has fired the opening salvo, delivering a question to Henry that results in several branching conversation choices you can reply with in the finest tradition of point-and-click adventure games, but what happens when Henry, or rather, the player wants to tell Delilah something? It’s straightforward enough to slap a radio icon against an objective that the quest-giver has sent you to, “Go to this landmark and call me on the radio when you get there,” but having a portable radio in your hand just wouldn’t be believable if you were only using it within these narrow constraints. 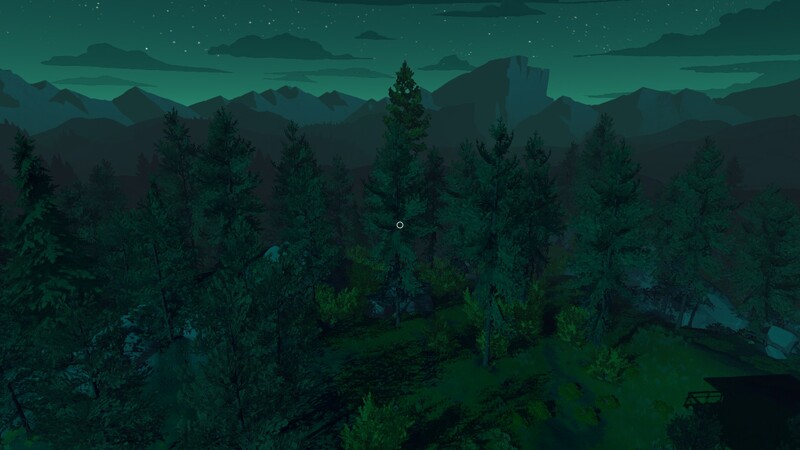 This is where Campo Santo took a little bit of a leap of faith with the conversational mechanics in Firewatch, and this has seriously paid off for the experience as a whole. You might see something up ahead that obviously needs reporting to Delilah, like a thin plume of smoke indicating a fire that needs to be investigated, but you might also have something to report that’s a little more abstract and complex. While there are many interactions that are used to progress the story forward, from rudimentary fire prevention to the mystery that evolves around Henry and Delilah, it’s often the inconsequential conversations that often hold the most joy. Report to Delilah that you think a meadow is beautiful, and she might tell you that it’s a lovely place to camp. Report to her that you’ve been stung by a bee, and she might make fun of you for being a baby. Tell her that you’ve seen some unusual stone circles in the grass and she might recommend a tourist attraction you visit on your drive home at the end of the summer, and tell her about a small body of water she discovered? She’ll probably tell you the funny story of why they had to confiscate the sign telling you what it’s called. These are all incredibly gentle and subtle ways of building your relationship with Delilah, but it’s a two-way street. If you’re not very nice to her, or do something to downright piss her off like badgering her for something she clearly doesn’t want to talk about, she might sulk with you and not respond to your calls for a short time; at least until the next important story event comes up, in any case. Talking to Delilah genuinely feels like having a real conversation with a real human being. I don’t think I ever found myself presented with a situation where I had to choose something I’d never say because the writers’ choices were too outlandish, and the way their relationship progresses through this natural and beautifully written dialogue – filled with as many swear words and crude jokes as it is poignant personal revelations and important discoveries, just like real life – is nothing short of an absolute masterpiece. 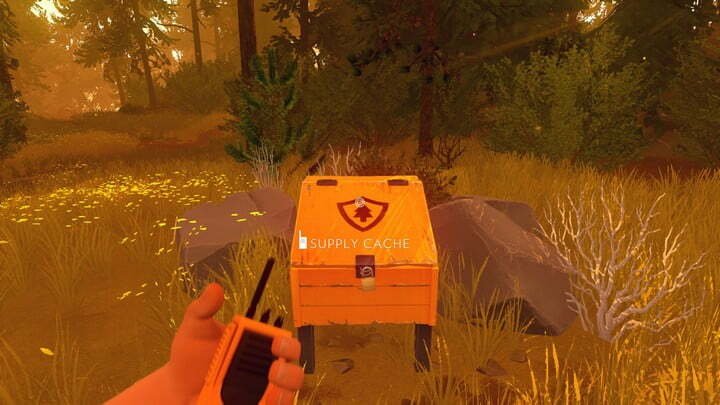 Everybody else may as well pack up and go home: in Firewatch, Campo Santo have created the perfect video game dialogue system. It’s just that good. It may not have the wildly variant ‘butterfly effect’ story arcs of Until Dawn or Telltale’s offerings – truth be told, I think there’s only one possible ending here, without throwing multiple play-throughs at it to be sure – but the breadth of choice on offer in Firewatch is more about the relationship you build and the way in which you reach the end, than having any impact on the end result itself, which is an important distinction and something of a lesson in life. Let’s also not forget that without two of the best acting performances I’ve ever come across – that’s acting performances, end of sentence; there are no ‘voice acting in a video game’ caveats here – from Cissy Jones as Delilah and Rich Sommer as Henry, this wouldn’t be such a believable story and a remarkable experience. From its beginnings as an innocent tale of burgeoning friendship and escaping personal problems (a charming undercurrent that is thankfully not lost as the story progresses through to a roller-coaster of mystery and suspense) with some moments of genuine sadness in amongst the charm and humour, Firewatch and its remarkable performances are incredible from start to finish. 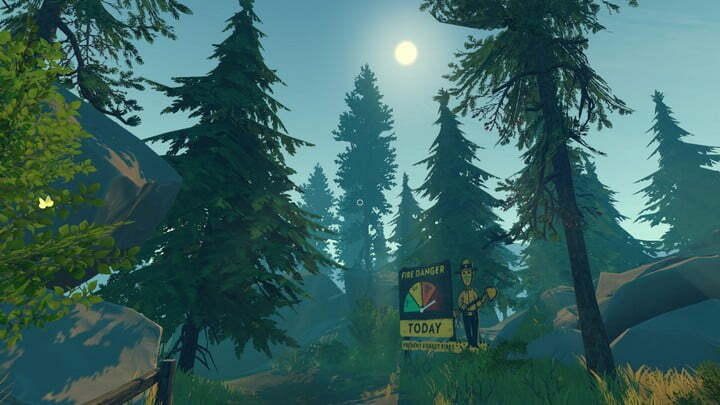 In summary: Should I play Firewatch? When Henry finds a Walkman, I would have liked to have been able to listen to some 80s tunes as I hiked the wilderness. Some of the dialogue choices are a little quick, with the tempo picking up the more stressed Henry and Delilah become – my wife and I like to play branching adventure games by committee, and I had to go all unilateral on the radio at times. I would have liked more of it. That’s not to say the game is too short – the narrative is tightly focused and it leaves the player wanting more, which probably means it’s the perfect length – but it’s simply a world I would love to spend more time in. It would of course be nice if the PS4 version looked a little sharper, but I’m sure they’re working on that – you may prefer to play it on PC in the meantime, if you have both options available. The PS4 update has certainly made a difference to the game’s performance. Frame drops appear to have gone. Shadows not longer pop in quite so obviously.